Apple is a tech giant, and as such, it encompasses a set of value propositions that make Apple‘s brand recognized, among consumers. 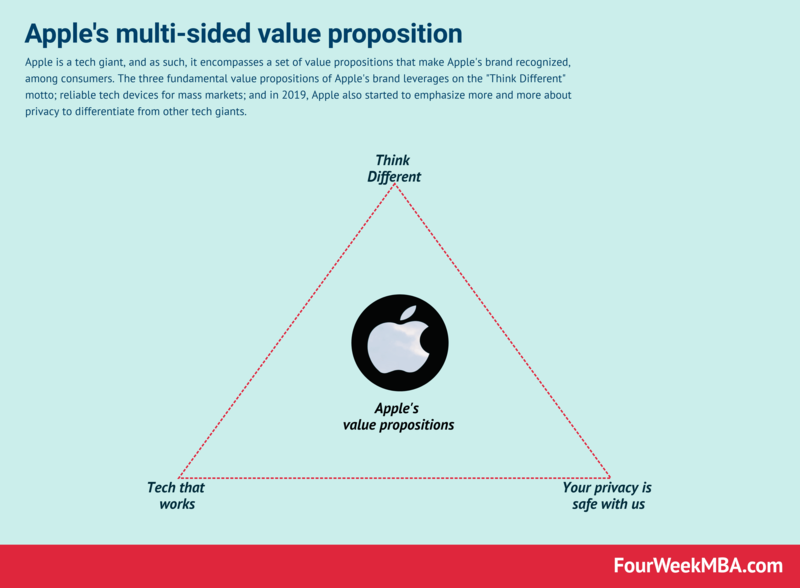 The three fundamental value propositions of Apple‘s brand leverages on the “Think Different” motto; reliable tech devices for mass markets; and in 2019, Apple also started to emphasize more and more about privacy to differentiate from other tech giants. What is Apple’s value proposition? What do they really sell? Apple is maybe the brand that is the most frequently mentioned by marketers. For many, it is a live case study. And the truth is that Apple’s value proposition has changed a lot over the last few years. As the author of the recently-published innovation book, The Value Mix, I’ve designed and gathered a range of tools that product managers and entrepreneurs can use to create new products and services. In this article, I want to focus on the value proposition of Apple and how it has changed over time. Many people see Apple as being the inventor of the iPhone. But the brand has more to offer. Apple started to build a name for itself when Steve Jobs released one of the most famous TV ads, Apple’s Think different. At the time, Apple was selling the MacIntosh, a simple personal computer. It positioned itself as the alternative to the status quo led by IBM. Apple was speaking to creatives–the people who want to think differently. For years, the brand followed through. It gained traction among professional designers and movie makers. Every advertising agency was equipped with Apple products. Obviously, the tech and its software were good. But it wasn’t just about the technology. A signal that if you were using Apple products, you were part of the cool kids. This is why every advertising agency had to have an Apple computer. It was a signal they were sending to their clients (we’re creatives and have cool ideas) as well as their employees (here’s a cool place for work). In many cases, it’s also interesting to define your audience by who you aren’t targeting. In the case of Apple, they weren’t interested in the laggards. At this time you would never see an Apple product in an investment bank or a law firm. These people stand for serious and old-fashion. IBM was perfect for them. The releases of the iPod and iPhone were a tipping point for Apple. The brand moved from appealing to Early Adopters to addressing the mass market. At this time, we started seeing more and more people adopting Apple products. And in many cases, the iPod and iPhone became entry products to sell more laptops. Apple started standing for something else. It wasn’t about being and thinking different. It became about choosing technology that would just work. Apple was just a better alternative to Microsoft + Intel (for laptops) and Samsung or HTC (for smartphones). Yes. By choosing Apple, you chose less customization. But what you were saying about yourself was that you didn’t care about the freedom to set up your phone or laptop. You just wanted something that worked. The Company is committed to bringing the best user experience to its customers through its innovative hardware, software and services. It’s all about providing a seamless experience, i.e., a technology that works. Over the last couple of years, we’ve become more knowledgeable about what happens to our data. Many consumers are now worried about the amount of data that Facebook, Amazon, and Google have about them. And Apple now aspires to be a safer alternative. They demonstrated that during the CES 2019 with a massive ad displayed in Las Vegas and the apple.com/privacy webpage. Apple’s main products today are the iPhone and iPad. They make most of their money when you subscribe to one of their services (such as iCloud or the new Apple News), buy a new piece of hardware, or download a paid app. They want to create a safe, reassuring ecosystem that makes users want to remain part of it. Now that Apple has a more significant market share, they focus on growing their customer share. So today, Apple’s most recent value proposition seemed to be geared towards privacy protection and being part of a safe ecosystem.